We’d love your help. Let us know what’s wrong with this preview of Targets in Ties by Tristi Pinkston. 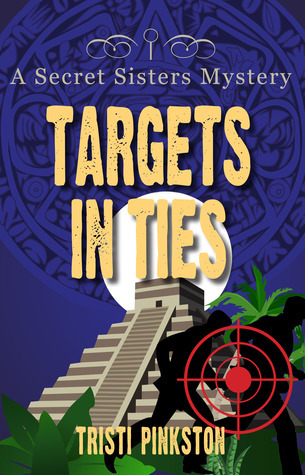 To ask other readers questions about Targets in Ties, please sign up. I hadn't read any of the other Secret Sisters mysteries and apparently this is the fourth book in the series. It didn't bother me much, though, because it was easy to pick up who the characters were and their endearing quirks that totally made the story. It probably would have been a richer reading experience had I known all the history between these characters, but I don't know that for sure, since, of course, I haven't read the others. How's that for logic? The story begins with three little ol I hadn't read any of the other Secret Sisters mysteries and apparently this is the fourth book in the series. It didn't bother me much, though, because it was easy to pick up who the characters were and their endearing quirks that totally made the story. It probably would have been a richer reading experience had I known all the history between these characters, but I don't know that for sure, since, of course, I haven't read the others. How's that for logic? The story begins with three little old ladies, Ida Mae, Arlette, and Tansy getting ready to take a trip south of the border. While they're there, they'll also pick up Ida Mae's nephew, Ren, from his mission. Before they can do that, however, Ida Mae gets caught up in the intrigue surrounding an antiquities thief who claims he's innocent and needs the three ladies' help. As they all fall deeper and deeper into this web, the ladies don't know who to trust and where to turn for help, but they sure got themselves in a lot of trouble trying to get themselves out of trouble. If you know what I mean. It's a cozy mystery done well. I liked the straightforward feel of the book---both in the characters and in the plot. It was an afternoon read with a lot of fun one-liners that made me laugh. I think I'm going to pick up the other three mysteries in the series so I can catch up, and, of course, wait for the next adventure to come out! Targets in Ties is a face-paced story about three older ladies who journey to Mexico to pick up Ida Mae's nephew from his mission and encounter an international thief. I love the personalities of these ladies. Tansy is such an airhead, coming up with the funniest things; Arlette is kind of grumpy, yet she's a good balance for the other; and Ida Mae is kind of the ring leader--a busybody who sticks her nose where it doesn't always belong, but she's very likeable. This wasn't a long, complex novel Targets in Ties is a face-paced story about three older ladies who journey to Mexico to pick up Ida Mae's nephew from his mission and encounter an international thief. This wasn't a long, complex novel. There are twists and turns but it's very light and moves along quickly. I love how the ending sets up the next book, yet it isn't a drastic nail-biting cliff hanger. There are religious references, but they aren't the main focus, nor are they over the top. Tristi does is again. A cozy mystery with unforgettable characters. A trio of friends in their golden years set off to South America to see the sights before picking up Ren, Ida's nephew, who has been serving a mission there. Their vacation plans go slightly awry (of course they do) and we get some fun entertainment as they try to find their way out of one mess after another. I'm especially looking forward to the next book. It's about time for Ren and Eden to see what's up. I've been waiting a lo Tristi does is again. A cozy mystery with unforgettable characters. I'm especially looking forward to the next book. It's about time for Ren and Eden to see what's up. I've been waiting a long time. Is it possible for The Secret Sisters Mysteries to get even better than the last one? I am here to say, “Yes!” Targets in Ties, by Tristi Pinkston, had more laugh out loud moments than the last book. Of course life is never “normal”, when your name is Ida Mae, and trouble follows you wherever you go. Ida Mae, Tansy and Arlette are touring through Mexico with a jewel thief on their tails. They are in Mexico for some R&R and to pick up Ida Mae's nephew, Ren, who has been on a two-year mission Is it possible for The Secret Sisters Mysteries to get even better than the last one? I am here to say, “Yes!” Targets in Ties, by Tristi Pinkston, had more laugh out loud moments than the last book. Of course life is never “normal”, when your name is Ida Mae, and trouble follows you wherever you go. "He could very well be telling the truth, but that doesn't necessarily mean we have to help him," Arlette said, "We could let him work this out on his own." "When have we ever let someone work things out on their own?" Tansy demanded to know. Arlette nodded. "You're right. We aren't very good at staying out of other people's business. But maybe we should start now!" "Ida Mae shuddered. "We've never been this close to danger before." She tried to process it. "We've been locked in closets and sheds, and injected with stuff, but...this is different. That person meant to kill someone today." Tansy shook her head. "They should take people like that and put them in leprechaun colonies." "You know how they take all of the leprechauns and make them live far away from the villages, where they can't be seen? Well, they should hunt down whoever shot at us and do the same thing to them." "I think you mean leper colonies." Ida Mae said. "It's all the same thing, isn't it?" "Not exactly, but I do understand your sentiment." That whole conversation was side splitting to me! In my mind I could see all of the leprechauns rounded up and sent away. Tristi's writing always brings out some emotion, especially that it makes me happy. I feel lucky to have her books to read. Targets in Ties is cleverly written, full of mystery,with a great plot, and of course, the three elderly ladies who know how to kick fanny, in their own bumbling, but delightful way! This is why Target in Ties receives 5 stars from me. Golden Girls meets Indiana Jones is this cozy mystery set among the ruins of Mexico. As the fourth installment of the Secret Sisters series, it is by far my favorite. I think it was extra fun for me to read because I just returned form a trip of my own to South America to visit my old mission stomping grounds. So, to read about Ren finishing his final days as a full-time missionary in a Spanish speaking land added an extra element of fondness for me. Ida Mae and her crew have headed down to pick Golden Girls meets Indiana Jones is this cozy mystery set among the ruins of Mexico. As the fourth installment of the Secret Sisters series, it is by far my favorite. I think it was extra fun for me to read because I just returned form a trip of my own to South America to visit my old mission stomping grounds. So, to read about Ren finishing his final days as a full-time missionary in a Spanish speaking land added an extra element of fondness for me. Ida Mae and her crew have headed down to pick him up and bring him home to the U.S. , but of course they meet up with some danger of their own as two age old enemies and antiquity thieves are using the old ladies as pawns in their plot to recover an old stash of precious amber. There is historical Mayan myth, local tradition and fun sleuth elements packed into a clean fun read I would recommend to all. If you enjoy Ally Carter's Heist Society or Josi Kilpack's culinary mysteries this one will be your kind of book. And if you haven't read number one in the series yet, now's the time to start. Well done Tristi!! Tristi Pinkston's Secret Sisters Mysteries make me laugh. They are lighthearted, clean, humorous books that are perfect for days when you just need a good laugh. Targets in Ties is the 4th book in the Secret Sisters Series and I enjoyed it just as much as I did the first three books. Ida Mae, Arlette, and Tansy are once again caught up in an adventure. This time they are travelling through Mexico headed to pick up Ren from his mission when they cross paths with an International jewel thief. What Tristi Pinkston's Secret Sisters Mysteries make me laugh. They are lighthearted, clean, humorous books that are perfect for days when you just need a good laugh. Targets in Ties is the 4th book in the Secret Sisters Series and I enjoyed it just as much as I did the first three books. Ida Mae, Arlette, and Tansy are once again caught up in an adventure. This time they are travelling through Mexico headed to pick up Ren from his mission when they cross paths with an International jewel thief. What follows is another crazy adventure for this oddball team. Kidnapping, grand theft auto and a cross country chase are all in a days work for these mystery solving amateur sleuths. If you are a cozy mystery lover or those just looking for a quick, clean read that will make you smile pick up one of Tristi Pinkston's Secret Sisters Mysteries. This was a great addition to the other books in the Secret Sisters series. I really liked this book, as did my daughter. The three ladies went on a trip to Mexico to sightsee before meeting up with Ren to bring him home. The ladies are kidnapped twice by two different men. It was a good book. I am looking forward to reading the next book in the series. I just read this book again. Even when on a mission, Ren still gets into trouble. This is my favorite of the Secret Sisters mysteries so far. Can I just say that I feel bad for the villains who think they can outsmart Ida Mae? Those poor pitiful morons. They should know that with age comes respect, wisdom, and a whole lotta sass - at least in the case of Ida Mae, Tansy, and Arlette! This is one of the books that I won from Goodreads :). It is a mystery involving three "little old ladies" who are on a Mexican vacation and find trouble...or maybe it finds them. I enjoyed this book and now I need to see if the library has the first books from the series so I can read them before the next one comes out this summer. Wonderfully entertaining and fun. These ladies never disappoint and it was awesome having Ren back. This book is just as enjoyable and fun as it's predecessors. Fun twists and turns with humor and heart. Well done, Tristi! This book wasn't as good as the previous books in the series. There was just so many unbelievable things that happened. This was my least favorite of the series. I made myself finish it because I was hoping it would get better. Read if you loved the first three. LOved it! another exciting adventure with the old ladies! Another fun read from Tristi! I love Ida Mae's spunkiness! She gives us all hope that we can be that vital as we age! I love the Secret Sisters Series and I am definitely looking forward to the next! I liked this book better than the first two books in the series, also. Fun plot. I still scan-read it all. This book was really funny. I really love Ida Mae's character. Becoming an 'older' lady doesn't look too bad if you had a personality like Ida Mae. I'm a historical/contemporary fiction author, stay-at-home mom, homeschooler, freelance editor, and the owner of Trifecta Books.